Chord Co launches Reference versions of its midrange interconnect range | What Hi-Fi? The Chord Company has unveiled Reference versions of its Cadenza, Chorus and Anthem analogue interconnects. The Chorus Reference and Anthem Reference are all new, while the Cadenza Reference has been heavily revamped. 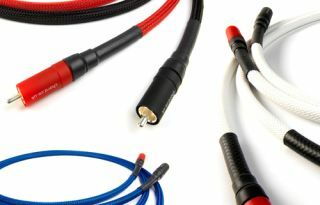 All three have the new high-performance VEE 3 (Vibration Eliminating Enclosure) plug, first seen in July on the new Chord Co Crimson, Cobra and Chameleon cables. What's more, the Chorus and Anthem Reference cables are the first in the portfolio to use ARAY technology developed from the flagship Sarum series. Key features on the Cadenza Reference include a twisted-pair configuration with heavy-gauge silver-plated OFC signal and return conductors and low-signal-loss PTFE insulation. Shielding is provided by a woven-braid, combined with an over-wrapped foil shield. Prices range from £195 for a 0.5m pair to £220 for a 1m pair, with each extra metre costing an additional £60. They're available with RCA or Neutrik XLR plugs. The Chorus Reference has a new tri-conductor configuration, with multi-strand silver-plated copper conductors arranged in a triple-twist configuration, and insulated with PTFE. Prices are £260 (0.5m pair) and £350 (1m pair). Each extra metre costs £190. Finally, the Anthem Reference has the same tri-conductor configuration as the Chorus, with silver-plated conductors. Like the Cadenza and Chorus, it's available as an RCA-to-RCA stereo pair or XLR-to-XLR stereo pair. Prices are £330 (0.5m pair) or £450 (1m pair). Each extra metre costs £240.